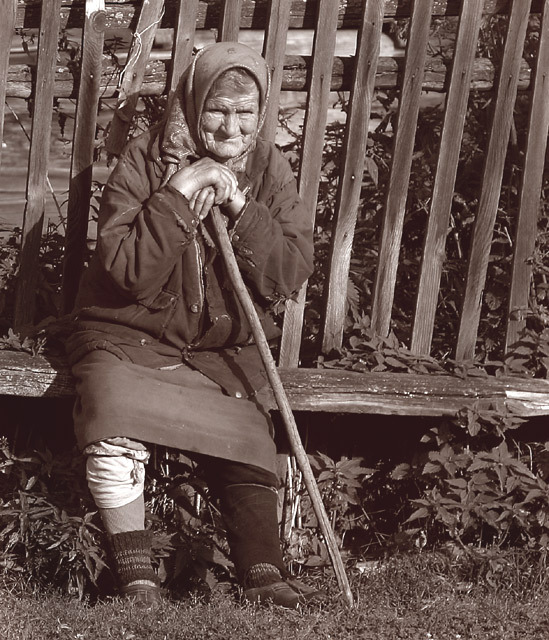 I was in a village deep in the Ural Mountains and saw this wonderful old lady just sitting and watching the traffic go by. i have looked through all your pictures and every one of them is incredible. Great capture Gary. I carry my camera around with me a lot hoping to get a picture of real humanity like this one. Others may quibble about technical issues but this is the kind of photograph which will last, and be meaningful in anyone's album. Well done Kiwi, my best photo yet and you still beat me with a holiday snapshot! Get yourself over to Brighton and give me some tutorials. Thanks for all your comments for this photo. It really didn't turn out the way I wanted though and I am surprised that it scored so well. I took this on holiday in Russia and processed it on my laptop which I had with me. When I saw it on my desktop once the voting had started it looked completely different. The sepia toning is too extreme, the contrast is too low and it is lighter than I wanted. I never realised there is so much difference between laptop and computer screens. A few of you mentioned the angle of the bench, well it was sloped like that. Actually so was the fence and the house. This village is from 1703 and everything is on a lean in one or the other direction. And yes she let me take her photo. Way out in the Urals where I went, people hardly ever see anyone else outside of their villages and were so happy to see us and have their photos taken. Wow there should be a law against this many top ten results. Did she know you were taking this, or is this zoomed majorly in? Its a fantastic photo. The contrasting angles of the cane and fence are fascinating. Is she leaning, or did you tilt the image? Good in B/W I like the expression. Great shot, not sure about the sepia toning though, I think I'd have prefered normal b&w. The tilt is a bit bothersome. She looks like a very approchable subject. I even care about her leg, want to know more about her, so, to me, this is a good photograph, if not for that darn tilt. I gave you an 8. What a cool looking lady! I betcha one could have some wonderful conversations with her. I like this. Very powerful. Someone you appears truly at rest. Good photo but a little washed out. Needs more contrast. Very good picture. I would like to know her. The picture is just a little out of focus, but otherwise perfect for the challenge. Really good photo....really fits this category...I love the sepia tone...adds interest and character to the shot! Truly at rest. I like this photo, personally, I would add a little more contrast, but I think its fine as it is. Nice! No technical prowess here, but what a find! Wonderful humanity. You just know this rest was well earned! Love the tones! I think you need to level the bench out to make this shot work. Great expression on her face. Nice lighting. Was the fence slanted or was the camera slanted ? Great picture anyway. I find the right hand edge with the light coloured bench a bit distracting. I wonder what a tighter crop wouold look like. I like this portrait and the monochromatic treatment, but I think the tomal range could be better. Darkening the shadows and other dark areas would give it a richer feel. Proudly hosted by Sargasso Networks. Current Server Time: 04/24/2019 11:51:06 AM EDT.